The refuse that the Otyughs had been wallowing in appeared to contain a lot of stuff that had been created by civilised people, containers, food waste and the like. Leading up from the waste pit there was a chute, which Terato checked out. Hearing muted voices, he listened into their conversation. 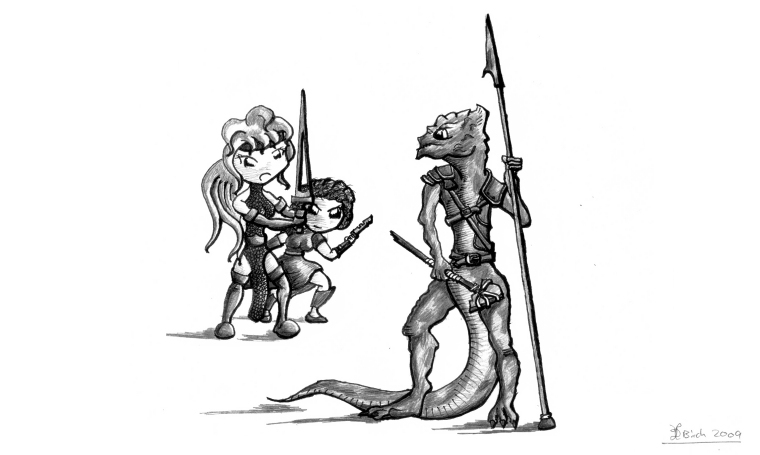 The voices were those of troglodytes, and they were arguing as to whether or not the noises they'd heard from below constituted an attack, or simply the otyughs and carrion crawlers having a fight - this apparently was a common occurence. We quickly resolved to ambush them before they got too curious, and took out the group. The troglodyte guards were no challenge, although once they were defeated, argent took an unusual interest in their fire. I spent the time cleaning myself off with the amphora of infinite water. It turned out that the fire was a source of communication between the troglodites and "some drow" probably an advanced scouting troop. Argent spoke briefly with the drwo, threatened them a bit and then cut the conversation short by disenchanting the fire. Moving onwards, we encountered another set of troglodyte scouts looting a crypt. Come to think of it, none of us ever questionned why there was a crypt down there in the first place, we were all a little preoccupied with the wight that the troglodytes unwittingly released. Thinking back on it, it doesn't seem to make any sense at all really. I'll go ask Vincent about it.